t emissions of mercury and other hazardous air pollutants, but it may only be a temporary setback for regulators. The justices split 5-4 along ideological lines to rule that the Environmental Protection Agency failed to take cost into account when it first decided to regulate the toxic emissions from coal- and oil-fired plants. The rules, which took effect in April, will remain in place while the case goes back to a lower court for the EPA to decide how to account for costs, environmental advocates say. They were supposed to be fully in place next year. The issue was whether health risks are the only consideration under the Clean Air Act. Writing for the court, Justice Antonin Scalia said the EPA was unreasonable in refusing to consider costs at the outset. He was joined by Chief Justice John Roberts and Justices Anthony Kennedy, Clarence Thomas and Samuel Alito. “Over more than a decade, EPA took costs into account at multiple stages and through multiple means as it set emissions limits for power plants,” Kagan said. She was joined by Justices Ruth Bader Ginsburg, Stephen Breyer and Sonia Sotomayor. The EPA said it is reviewing the court’s decision and will determine any appropriate next steps once a review is completed. “EPA is disappointed that the Supreme Court did not uphold the rule, but this rule was issued more than three years ago, investments have been made and most plants are already well on their way to compliance,” EPA spokeswoman Melissa Harrison said. “EPA already has an economic analysis that it can rely on to demonstrate that the public health benefits of the standards far outweigh the costs,” Patton said. See here and here for the background. I would obviously have preferred a win here, but at least the EPA will get another shot at this. As noted in the story and acknowledged by ERCOT, most power plants are already there, and there are (in Texas, at least) no new coal-fired plants about to come on line. As Vox explains, the national effect of this ruling is likely to be minimal as well. That’s the only thing at stake here: how long these 22 plants get to keep spewing [hazardous air pollutants, HAPs]. That’s not nothing — especially to the vulnerable populations exposed to those toxic pollutants — but it amounts to a mopping-up operation. You might note an irony here. The entire Supreme Court case is premised on the fact that [mercury and air toxins, MATS] regulations are “the most expensive ever.” Industry claims it’s outrageous that EPA didn’t consider these extraordinary costs, which it says could cause blackouts and destroy the power sector and leave the US a smoking ruin. Oh, but, by the way, while we were debating this, the power sector went ahead and complied with the regulations. Notice any blackouts? Any big bankruptcies in the power sector? Any economic devastation? No. As usual with air pollution rules, when the power sector quits complaining and starts complying, the costs turn out to be much lower than anyone anticipated. This case was a fight over a question that’s already been settled by facts on the ground. So there’s that. 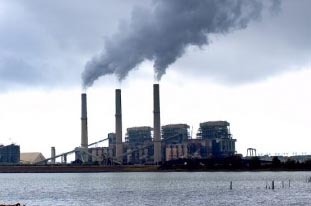 The bad news is that the coal-fired plants we have now in Texas are chock full of mercury and other toxins, which they release into the atmosphere every day. So every extra day we have to wait for the new rules means that much more poisonous filth in our environment. Isn’t that nice? Daily Kos, Kevin Drum, and Ed Kilgore have more.